Incorporating the 5th generation of the Athena scaler – Barco’s custom-designed image processing technology, ImagePRO-II supports higher resolutions, higher frame rates, higher quality de-interlacing with advanced Motion Adaptive processing, faster source acquisition, better color depth and native support for all the latest computer formats. As formats and interface requirements frequently change, the Athena scaler is built to be adaptable providing superior signal clarity, while maintaining a low processing latency of only one frame. Whether you are saving a setup for later, or need to copy a setup to multiple units, the incorporated USB back up and restore functionality makes configuration simple and efficient. ImagePRO-II is easily controlled via the front panel, browser or a mobile device. 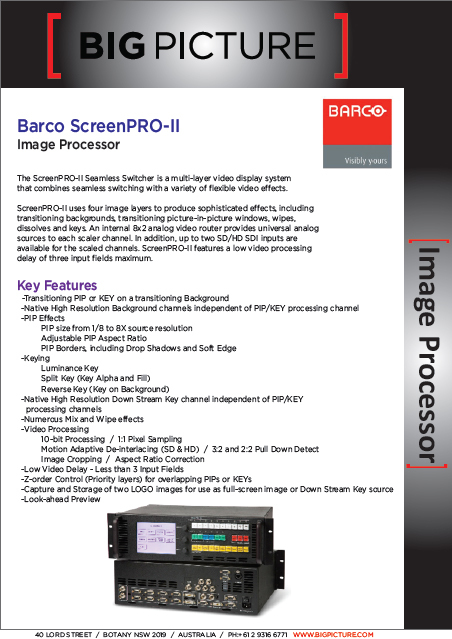 Featuring the fastest automatic source acquisition available, the ImagePRO-II excels in automatically acquiring and locking to any input signal.On the output side,ImagePRO-II can also automatically determine the format of the attached display optimizing its output resolution to match the display’s resolution. As the ImagePro-II built for the live event industry it has been designed with the road in mind. With features like field replaceable DVI connectors, 1 RU form factor and professional RtherconTM connector ImagePro-II supports the demanding environment of any live event.